Contact us at | RJO'Connell & Associates, Inc.
RJOC is located in The StonehamBank Office Building at 80 Montvale Ave., Stoneham. Visitor parking is available by the main entrance in the front of the building. Our office is on the second floor, Suite 201. From Boston: I-93 North to exit 36 (Montvale Avenue). Turn right onto Montvale Ave. Drive .2 miles. #80 Montvale Ave. is located on the right. 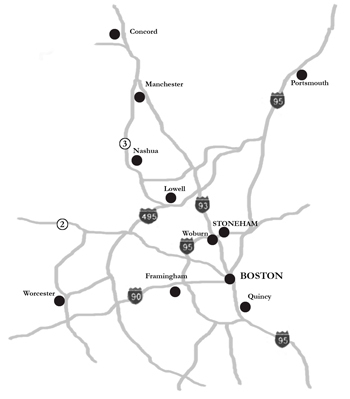 From the North of Woburn/Stoneham: I-93 South to exit 36 (Montvale Avenue). Turn left onto Montvale Ave. Drive .4 miles. #80 Montvale Ave. is located on the right. From Rte-128 / I-95: Exit 37 ( I-93 south toward Boston). I-93 South to exit 36 (Montvale Avenue). Turn left onto Montvale Ave. Drive .4 miles. #80 Montvale Ave. is located on the right.